A while back a friend sent me a link of this science vs faith diagram that's been going around for more than a while (e.g. here and here and here). But, treat a few specific warnings as just warnings. I still want them to show up as warnings, which is to say that I don't want them to disappear altogether. 'CS0618 Obsolete' is a good example of this. This is vaguely referred to in the docs here, and the list of error codes can be found here. Setting up a new computer I somehow managed to break Visual Studio macros. Finally found this, which fixed it. (See the Workaround tab). How disappointing! I've just started to dip a toe into C# default parameters. And they have to be compile-time constants. Sure, it makes a lot of sense, but how about allowing static readonly properties as well? // Not too much to ask for? Way back in the '80s I cut my programmers teeth on a Microbee 32k. Back on a classy green and black CRT, with an audio cassettes for permanent storage. One of the things I remember noticing was that while playing a tune (1-bit square wave), if I held down a key on the keyboard that the frequency would drop slightly. This was presumably due to the poor 2MHz CPU having to stop counting how long it has spent on each waveform to go and service the keyboard IRQ. How quaint. Now, as I sit at a PC that's at between three and five orders of magnitude more powerful, depending on the measure, I've just noticed an errily familiar behavior. With my sound turn up, I hear a faint low-pitched hum even though no sound is playing. Now, whenever I move my mouse it turns into a faint high-pitched squeal. I actually get one of two high pitches depending on how fast I'm moving the mouse. Not 100% sure what's going on here, but as they're USB powered speakers, I'm guessing that the transmission of mousing data is causing some interference on the power rail. I guess it shouldn't be surprising given that people have figured out how to capture keystrokes from EM emissions. Here's a few Visual Studio Macros that I can't live without at the moment. They're somewhat pieced together from bits I found online and customized for my needs. Thanks to whoever you are! Locates the currently open file in the Solution Explorer panel. Attaches debugger to a service. 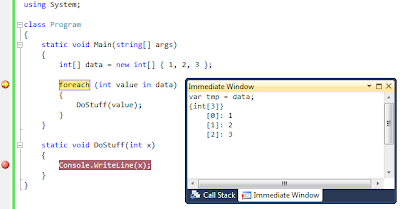 Attaches debugger to an open Silverlight window. It seems to me that the logical thing to do in Silverlight when building some sort of composite control is to create a UserControl, expose some properties, add some controls to the user control, and bind them to those properties. For example, a custom CoffeeMug control might want to expose MugColor and PercentFull properties. However, it's taken me quite a while to figure out how to get this to work properly. The problem is in selecting the binding source. WCF offers the FindAncestors binding helper, which can be used to locate the user control relative to the control being bound, but Silverlight offers no counterpart. This works pretty well in simple circumstances, but it wasn't working for me in DataTemplate scenarios, such as in the DataGrid. I was having similar problems with using custom controls in custom ComboBox and ListBox data templates. Well, apparently its a known shortcoming of Silverlight. When the data template is asked to make a concrete instance, it no longer carries the necessary context information to resolve element names directly. It can however be overcome by manually specifying the binding in code. This guy has also hacked together a behavior to make everything much nicer in an MVVM environment as well, but I don't think I'd go to that much effort personally. 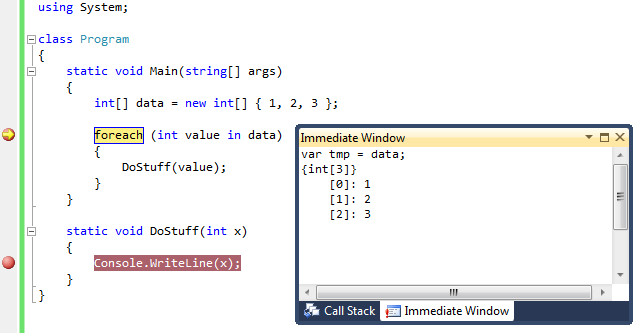 I was a bit disappointed to discover that the following code doesn't compile in C# 4. In particular, it seems that as the 'Thing' property is only a getter on the interface, any concrete implementation should be able to return a derived type, since it can be guaranteed that anyone getting the parent type from the interface will also be able to operate on the child type. So FTP stopped working for one of the GoDaddy websites I look after. It seems they decided the password didn't comply to their password policy, so they've deactivated it until I update the password. Fair enough. Perhaps. However, I'm amused by their new password policy regarding special characters. 1. Password must contain special characters. 2. Password cannot contain ?, ^, ', ", :, ;, $, &, <, >, ~, ` or space. I can't help but think of XKCD 936. It seems Enum.GetValues is not defined in the Silverlight client profile. 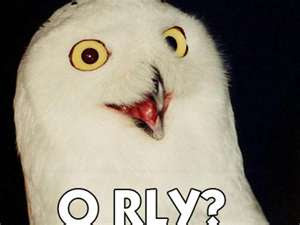 The owl says it best. Oh well, a hacking we shall go. Some time back I was trying to understand how Microsoft SQL Server handled bracketing and order of operations on table joins. Here's a breakdown I put together on how it works. Possible boring, although possibly useful for not shooting oneself in the foot. In short: the order and backeting of table joins may matter if you're mixing different types of joins together. This is the boring stuff. Skip down to the next major section if already familiar. Both equations are the same irrespective of the bracket grouping. Addition is said to be an associative operation. However, the same is not true for subtraction. Subtraction is a non-associative operation. Addition is commutative, but division is not. That is, the order of the operands matter. It should be no surprise that in T-SQL inner joins are commutative, but left and right joins are not, rather they reverse roles. T-SQL parses joins using left-hand associativity. That is, there is an implicit grouping to the left. This is to say, the following discussion applies equally to join ordering as it does to join grouping. If SQL statements present their tables in the same order, and use the same join and 'ON' clauses, then they may still give different results if the second join is bracketed. This is because left and right joins produce null values in the absence of rows in the auxillary table. These null rows survive if a second, restrictive, join is applied only to the auxillary table. However if the grouping of joins is such that the second, restrictive, join applies to the whole expression then these null rows don't survive. In some cases equivalence can be restored by adding a WHERE clause that removes the null rows, however this correction can generally only be made in one direction. The instance of A left B inner C is demonstrated as follows. The first expression has no bracketing, which is equivalent to left-hand bracketing because the T-SQL parser treats joins as left-hand associativity. The reason here is that when C is inner joined to B first, it constrains B, but then the entire group has no impact on A, due to the left join. Therefore A can return all of its rows. However, in the previous query, the left join between A and B occurs first. Therefore the more restrictive inner join applies to the rows in A first. One question of interest was how many unique configurations of the Snake are possible. 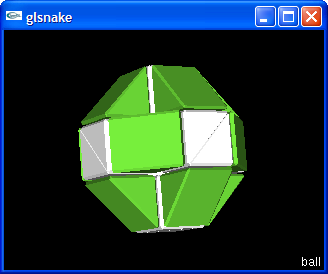 The Snake consists of 24 interconnecting prisms, with each interconnect able to be in one of four possible positions. This leads to a trivial upper bound of 423 = 70,368,744,177,664 distinct combinations. But many of these are not actually possible, as they may be configurations where the snake impossibly passes through itself. And most configurations will appear twice as mirror images. A trivial lower bound can be reached by starting with a straight snake and then only permuting every other junction. Every rotation will be along a parallel axis, giving rise to pairs of interconnects that are always on discrete planes: meaning that the snake can never bend back on itself. Halving guarantees no reflections. (Symmetrical would only be counted once, but this is a lower-bound). This gives 411/2 = 2,097,152 as a trivial lower bound. 13,535,886,319,159 = approx 421.81 combinations, including possible mirror image duplicates. To handle mirror images, each time it encounters a complete snake it then converts it to a normalized form as follows. The snake is represented as a string of 23 numbers (from 0 to 3). The string is then reversed. The two strings are compared lexicographically and the smaller is the normal form. If the string matches the normal form, then it is counted, otherwise it is skipped. This way potential reflections that appear twice can be counted once, but symmetrical snakes also get counted once. Note that I'm interpreting mirror images here as applying the same turns from either end, not if the volume produced is a mirror image. For example, I'm counting a left-handed corkscrew snake and a right-handed corkscrew snake as discrete. But if you just twist one piece 180 degrees at the start or the end of the snake, then I count that as the same snake. Behold. OK, it only took another two years to getting around to writing this up any telling the world. (mainly because I started writing up a detailed paper on the method, which quickly got boring). Hopefully anyone else who has tried this got the same answer. Along the way I also discovered that there are about 64,546,391 (approx 412.97 unique cyclic paths where the head and tail of the snake connect. Also, only a relatively small number of snakes are symmetrical. I should probably go and get some sun, or social interaction, or something now. 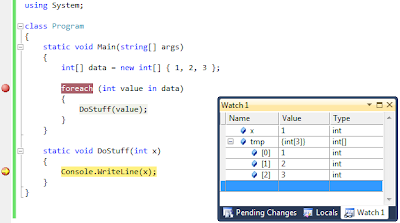 I love the covariance/contavariance support in C#4. That is the mechanism that lets you implicitly convert from an IEnumerable<Child> to an IEnumerable<Parent> was expected (covariance), and an IComparable<Parent> can be converted to IComparable<Child> (contravariance). Here Child obviously inherits from Parent. One of the biggest problems though is that this only works for classes and interfaces where the type parameters are either all outbound or all inbound for covariance and contravariance respectively. E.g. no methods on IEnumerable<T> accept T, which is covariance. And no methods on IComparable<T> return T. Eric Lippert wrote a bunch of posts worth reading about while the compiler team were considering variance. This is somewhat inconvenient. For example it means that IList<Child> cannot be assigned to IList<Parent>, or vice-versa, because IList<T> methods both accept and return T. And often one may wish to write a method using IList<T> rather than IEnumerable<T> as it allows for direct element access. It is particularly frustrating because I may well only need to use the methods that read from the list, and so if IReadonlyList<T> existed then all might be sweet. Now I was wrestling with this kind of thing the other day when I read Lippert's post on What is this thing called a Type, which got me thinking about it all again. Here he's again talking about how various operations tranform one Type into another. OK, to the point. Here's the idea I was thinking. What if it were possible to create modified types based on existing interfaces and classes that only present the input or output methods. IList<out Mammal> and IList<in Mammal> becomes types that are declarable in code. IList<out Mammal> exposes only the subset of IList<Mammal> that is covariant. I.e. 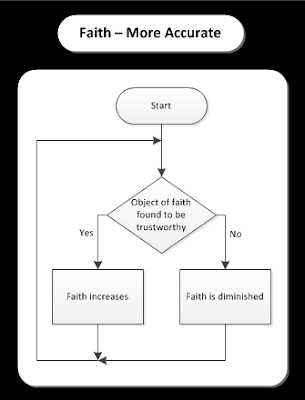 the methods for reading from the list, but none of the methods that accept T parameters. IList<out Giraffe> could be assigned to IList<out Mammal>. As a type, IList<out Mammal> itself would be smaller than IList<Mammal>, so it is always possible to convert from IList<Mammal> to IList<out Mammal>. So, finally IList<Giraffe> could be assigned to IList<out Mammal>. Likewise, IList<in Mammal> exposes only the subset of IList<Mammal> that is contravarient, exposing only the methods for modifying a list. By the same (but contravariant) argument, IList<Giraffe> would be assignable to IList<in Mammal>. // mammals.Count is available as it doesn't use the type parameter. This would be a wonderful feature. Anyway, that's my two cents. ...a very long long while since I made a post. One may say that after dipping my toe into the Interblag to test the water for a while, I forgot all about it. And then subsequently forgot my password, followed by the email address I used, the login for that email, and finally (or additionally) the name of the blog according to blogger (since the only thing I could remember was blog.ylett.com). Trying to remember if I used to be this forgetful. Needless to say, the bar was slightly raised for making any subsequent posts. Over the years, every now and then an idea would pop into my mind, followed by "oh, I could blog about that... except I'll have to deal with this mess." Cue chirping crickets. Problem now solved. Now all I have to do is to figure out how to get back down to just one Google account (since I somehow managed to get my gmail on a different account, and Google+ on a different one again). And think of something to write about.